To go along with the Hello Kitty cookies for my friend Vicky from my last post, I also made a Hello Kitty cake! And since the cake wouldn't be enough to feed everyone, I also made matching cupcakes. For the cake, we decided on a chocolate cake, filled with strawberry whipped cream, and covered with cream cheese buttercream. So I started by making my favorite chocolate cake recipe. The recipe usually makes two 8-inch pans, but since I was using a large Hello Kitty shaped pan, I used one recipe for each cake layer, which I mixed and baked in separate batches. 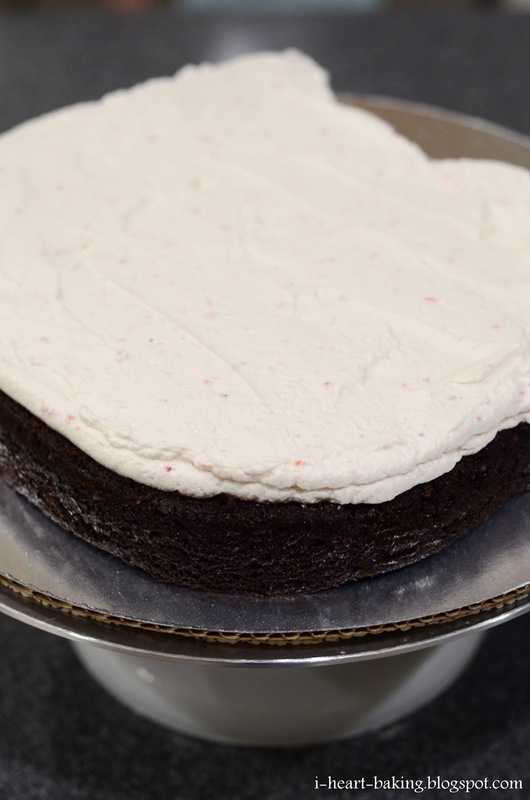 Once each cake layer was baked and cooled, I whipped up a quick batch of freshly whipped cream, and added a few tablespoons of freshly pureed strawberries. Then I piped a layer of it on top of my bottom layer of cake, and spread it out evenly with an offset spatula. Next I added the top layer of cake, and then the entire cake went into the fridge to set while I made the frosting. For the frosting, I whipped up a couple of batches of a simple cream cheese frosting, which I used to cover the entire cake in a crumb coat. Then I piped on the details (the eyes, nose, bow, and whiskers). And then filled in the rest of the face using a medium star tip. For the cupcakes, I made three dozen chocolate cupcakes covered with yellow cream cheese frosting, which I piped using a basketweave tip. Then I piped big ovals for Hello Kitty's face, used a leaf tip to pipe the ears, and used a small round tip to pipe the eyes, whiskers, nose, and bow. (See this post on how I pipe Hello Kitty step-by-step). 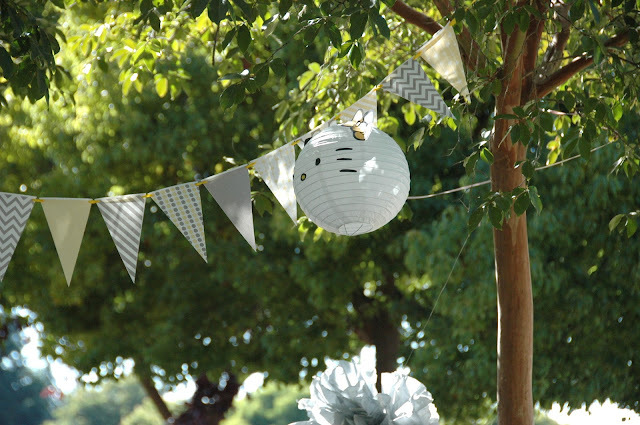 I thought the cake and cupcakes turned out super cute, and I loved the grey and yellow color scheme that Vicky chose! I hope everyone enjoyed the goodies! YAY thanks @Vicky ! so glad everyone liked them!!! The cake is great and the cupcakes are too cute!!! Yellow and Grey is a good color scheme also. I don't think people realize how much the color grey can go with. 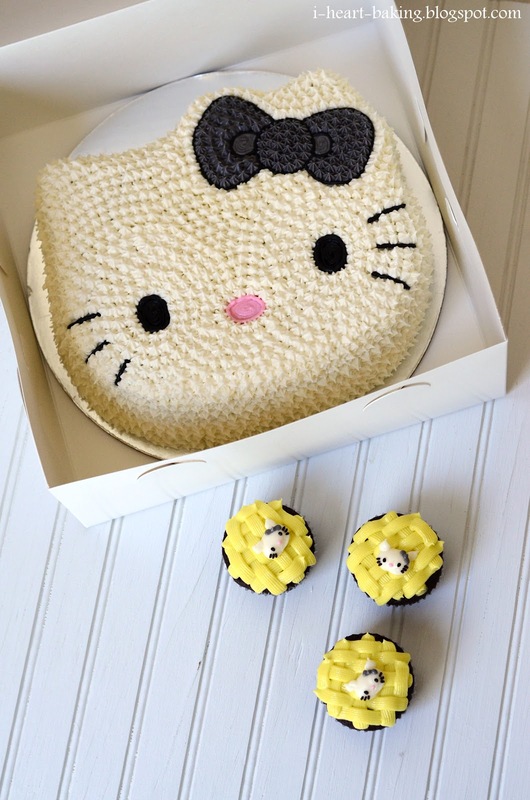 I have started to wait for hello kitty cakes and you amaze me every time! Love them all. I've been a silent reader of your blog for months now. And I must say all your creations are equally good and I bet all equally delicious :-) I hope it won't be too much to ask the size of your hello kitty pan and what does it look like? i am really keen to bake this HK cake but I honestly do not know what HK pan should I buy. Many thanks in advance and best regards! 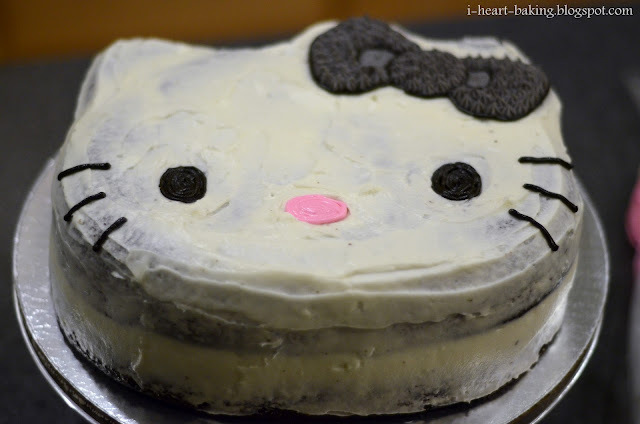 I love your blog and I love all your hello kitty cakes! You inspire me to make one... I would like to ask what is your technique so that the baked cake wont stick into the cake pan. Do you put butter into the cake pan so it wont stick? Thanks so much and keep on baking cute cakes! Thanks! I just found your blog, and am loving your hello kitty obsession!! yay! I'm putting together a little HK party for my daughter tomorrow...not sure what I'll have time to whip up, but I'm pinning your HK creations to my pinterest board!!! I love the macarons!! I've never made them, but now I totally want to try them :) great blog! Can u email me your cream cheese buttercream recipe?do u think tis frosting taste better or the Swiss meringue buttercream to go with chocolate cake? Oh my I so so love Hello Kitty because she's a cat and she's a theme of PINK! <3 I am so fond of this character that makes me compile stuffs of her like wallpapers and just lately I started a collection of party ideas and these Hello Kitty Birthday Cakes are awesome. I am just so happy I could pick some from your site. Credits will be added dear!